Critical parts are required more and more to be tested during the manufacturing process by more efficient and accuracy non destructive evaluation methods (NDE). Different techniques are nowadays used, but one of the most suitable method to be automated is the ultrasonic exam. Inspections with this technique over parts with complex geometry introduces additional difficulties to the standard inspection, which demands special requirements, from both ultrasonic point of view (high dynamic range, high resolution), and also from the handling of either the mechanical manipulation or the probe-sensor- it self. 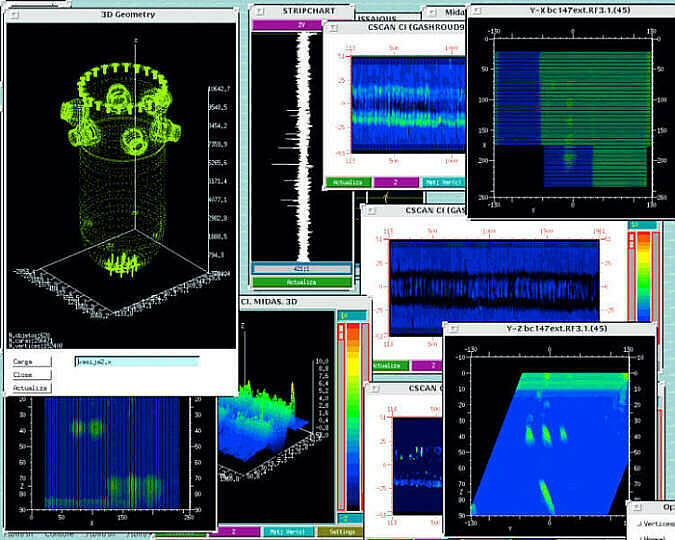 Criteria such total guaranteed coverage, automatic programming of scan plans, contoured follow-up mechanism and implementation of advanced data acquisition and analysis systems to process ultrasonic data analysis on the true 3D world, are concerns that need to be addressed to guarantee an efficient inspection of these components. These needs also presented in many industrial sectors are also deeply demanded on the aerospace market. However since the tremendous synergy existing between this market with other industrial sectors (such as the NDE of highly risk components used on the power plant industry) where the high reliability, controlled costs and high accurate inspection results are also required, it is clear that many of the solution developed under these specific requirements can be also easily exported to the aerospace market. The paper presents hereafter, how the Multi-technique Inspection Data Acquisition System "MIDAS", developed by Tecnatom, in a first stage to commit identified needs of the power plant industry (manufacturing and in-service inspections), has been deeply adapted to accomplish with the present and further requirement established on the aerospace market for complex shaped parts. Automated inspection systems by NDT are basically made of the mechanical scanner and its associated controller, which moves the sensors on the area of interest, and the sensor associated to the ultrasonic data acquisition and analysis system. This split is fully applicable whatever should be the market where the system should be applied. During last years a big effort has been carried out by the industry on the improvement of all above subparts which configure the automated inspection system. 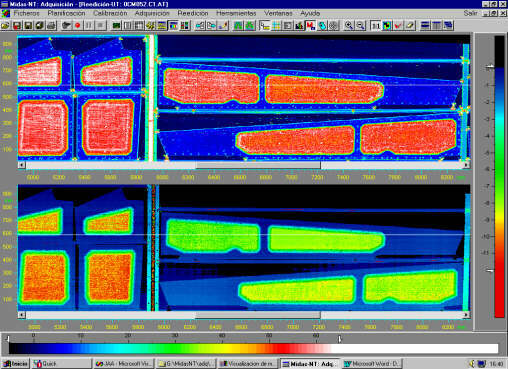 The full operational integration from only one single platform, the tremendous improvement on basic performances achieved by the electronics associated to the ultrasonic instrumentation, enhanced data processing by means of advanced and powerful computers, efficient and flexible software interfaces, are examples of areas where the automated inspection system have been dramatically improved during the last decade. Signal behavior as main data characteristic of the flaw instead of the data amplitude. Data processing on true geometry for a more simple and human free data misinterpretation. While these new goals that have been well covered on conventional shaped components, the complex shaped components really still as a great challenge to be covered by ongoing developments. However nowadays, the examination on practice of aerospace parts usually has only required the data collected limited to the C-scan views (top projections) on amplitude or time of flight (see Fig 2., to perform the required analysis and reporting of results. The information to be processed usually came from the highest value of the echo amplitude (or attenuation on trough transmission technique) and/or his associated time of flight. This approach that it is usually enough on the analysis of flat/single components during the manufacturing process and for very well postulated defectologies, presents some limitation in case of the inspection of complex shaped pieces or during the inspection to address different problematic not well defined. Industrial solution applied to cover such limitation has been oriented to split the complex shaped component on different subparts, each of them to be inspected as an isolated part with their associated time consuming. To characterize different defectologies some combined inspections by means of different manual scans to complement the automated inspection results is a good practice in most of the practical cases within the aerospace market. Therefore, the completion of the inspection (data acquisition) takes at least "double" time of a single inspection and the same could be stated of the duration of data analysis, prone to penalise the overall inspection reliability. However they are also sometimes where the acquired information results insufficient to accomplish a complete assessment with the following economic impact. The availability of high performance and low-cost computing equipment and the corresponding software technologies had promote the development of powerful and agile data acquisition and analysis systems for NDT inspection. To some extent, the NDE equipment and the data acquisition system tend to be totally integrated into the computing system. Therefore, this makes that the whole system becomes computerised and its functions programmable allowing the flexibility and adaptability to any type of inspection requirements. This refers to, f. i., the number of inspection channels, the information to be acquired, the user interface, etc. Along the last 15 years, Tecnatom was developing and manufacturing inspection systems for different purposes. Regarding data acquisition and analysis systems (DAAS), Tecnatom has developed an advanced multichannel ultrasonic DAAS named MIDAS, which incorporates state-of-the-art functionalities as described along the paper. MIDAS data acquisition hardware is PC-based and allows multichannel data acquisition, storage and screen rendering in real time. At the same time, through the mechanical scanner controller, it supervise the performance of the movements of the scanner. In order to optimize the inspection performance, the user could select the information to be acquired (f. i. amplitude, sound path, number of echoes, full signal, etc.). In some cases, it is convenient to acquire all the relevant information and works only with what is required. Later on, if needed any additional assessment could be performed. Flexibility is particularly important regarding data analysis. On the one hand, because that allows acquire and analyze (or re-analyze) the data according to the specific requirements. On the other, mainly concerning data analysis, because a number of tools are available to help the analyst during the data evaluation. Among them, it is worth mentioning the automatic analysis feature. This is very relevant when a large number of data had to be examined, fast response is needed, and the inspection reliability should be very high. For data analysis of complex shaped components it is necessary, first, to know and draw the geometry of the component and, second, to render the inspection data indications within the geometry of concern. 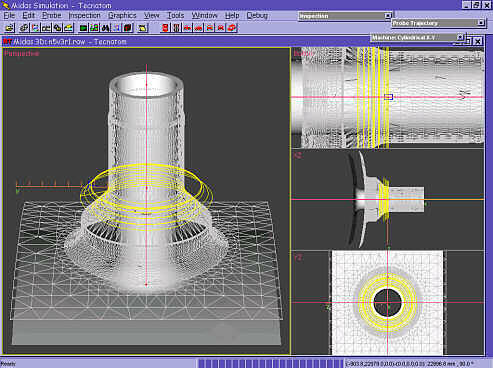 In that respect, MIDAS has a module-MIDAS RAY TRACING-, build up like a CAD programme, which allows (Fig 3.) the definition and drawing of geometries through a number of basic functions. 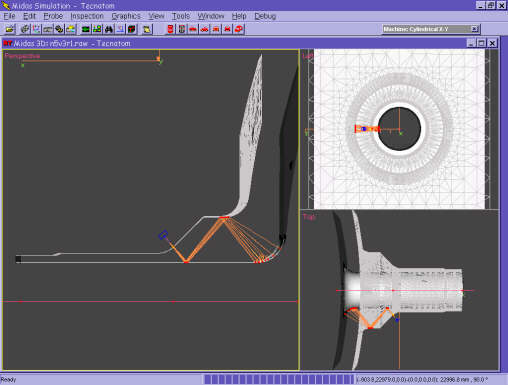 CAD files can be also imported from other well recognized data format (IGES, etc). In doing that, calculation of defect location and defect (depth and length) size can be made as well as the subsequent structural integrity assessment. With the advent of pieces of complex geometry the inspection preparation becomes a more difficult and time consuming task. Furthermore, the validation of the inspection procedure regarding both inspection volume coverage and detectability is not possible unless a practical trial is performed. To implement a practical trial, first, expensive specimens containing known defects are necessary and, second, carrying on the test which is also not cheap and is time consuming. There is a MIDAS module in charge of calculating ray tracing of ultrasonic probes. First, the user should define and sketch the component to be inspected. After that, he would figure out the (incidence angle, frequency, size of the) transducer to be used and the programme will simulate and draw the volume of the component that is isonified (Fig 4.) in a manner of a virtual inspection. The user can, in real time, change any parameter of the probe and assess about the coverage( Fig 5.). Additionally, it is also possible to postulate different types/sizes of defects within the geometry and study the ultrasonic response. Once the coverage has been assessed and the probe characteristics determined, the scan plan could be defined. 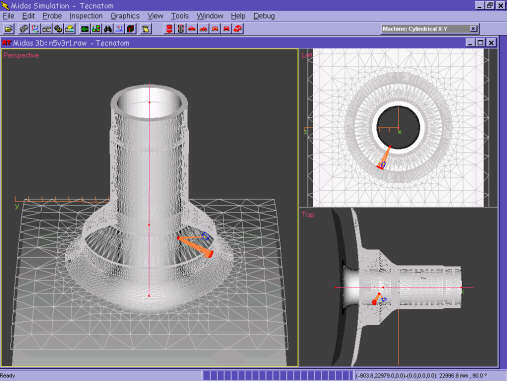 This module which model the inspection tool is very useful at the time of defining the scan plan of components of complex geometries and to check and either improve the efficiency of such scanning plan in a virtual manner before to need to perform any real test. After that, having the scan plan defined and optimized, it is also possible to automatically send it to the scanner controller, saving time and avoiding a lot of calculations, interfaces to be overcome and their associated human errors ( Fig 6.). Obviously the MIDAS data analysis software have different features to process acquired data in a proper and easily data interpretation ( Fig 7.) which includes between others the different projections B/C/D Scans and even through the processing of the previous water path, the cross section of the component being inspected can be also monitored. Sometime they are cases where new approaches for the application of ultrasonic techniques or as alternative advanced data processing of conventional data results, can enhance significantly the complete data results reliability. The simultaneous combination of through transmission with pulse echo in a single scan, can contribute to a more faster and accurate interpretation of data results as well as to complete the assessment in a single scan, facilitating data correlation and thus avoiding misevaluation. Other area of interest is finally the challenge to process data results on true 3D solids. If the component can be projected on singles views, all NDE data can be processed using this approach to reach the typical B/C/D scan. However in some cases the use of such projection not solve all the interpretation problem in case of complex defectologies and/or complex shaped parts. There is why is more and more demanding the possibility to process the real NDE data on the true geometry and even on the real solid projection of the component. These capabilities can contribute to reduce dramatically the misinterpretation of data and thus facilitating the transfer of data results to others groups of people (as the engineering offices) without a deep knowledge on NDE techniques. (see Fig 8. where a couple of real defects detected by ultrasonic is presented using MIDAS with the conventional 3 side projections B / C / D scans and in parallel in a composite true 3D view with the defects embedded in the solid. These requirements demand a full integration between the CAD file of the component being inspected with the NDE result, all of them in the same computer platform. They are many synergic interfaces and demands between the different NDE markets. The synergic between power plant and aerospace markets has been proven showing how the MIDAS system has been successfully adapted to commit the NDE aerospace market demands. The automatic ultrasonic inspection of complex aerospace parts remains as one of the more challenging to be covered by future developments. A big step has been done applying solutions just proven in other synergic markets, however the main differences existing between those, mean that further efforts need to be implemented to reach an efficient application on these features according to the specific aerospace market demands.